The European turtle dove is both a highly valued game species and a species of conservation concern, which is declining due probably to a combination of habitat degradation and unsustainable hunting. Although declines seem to be less severe in the Mediterranean region, it remains uncertain the extent to which ongoing land use changes will negatively affect this species. 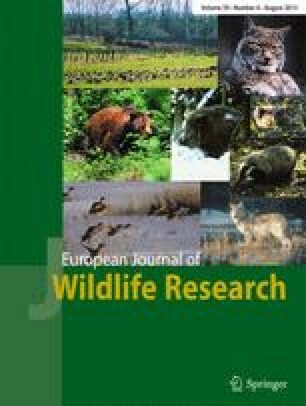 This study examined this issue, by estimating the effects of landscape composition on the broad scale abundance pattern of breeding turtle doves in continental Portugal. Turtle doves were surveyed in the breeding seasons of 2002 and 2003, from 3160 point counts spaced at about 1-km intervals along 158 transects of about 20 km, evenly covering the country. The frequency of occurrence of turtle doves at each transect was used as a proxy of species abundance, and related using GAM modelling to 21 variables describing land cover and woody linear features (e.g., hedgerows and riparian galleries). Turtle doves were most abundant in north- and central-eastern Portugal, with high abundances also recorded in the regions around Lisbon and along the Guadiana valley. Abundances were positively related to forest cover, particularly by broadleaved forests and by pine stands without woody understory, to cover by permanent crops, and to the density of woody linear habitats. Results suggest that conservation of Mediterranean turtle doves requires policies and management strategies reversing the pervasive trends of forest management neglect and agricultural abandonment, while preserving hedgerows and riparian galleries in more intensive agricultural landscapes. The online version of this article (doi: 10.1007/s10344-013-0702-2) contains supplementary material, which is available to authorized users. This study was funded by the Portuguese Foundation for Science and Technology (FCT), through the project POCTI/BSE/41067/2001, and grants to LG (SFRH⁄BD⁄64645⁄2009) and LR (SFRH⁄BPD⁄62865⁄2009). Thanks are due to António Barreto, António Melo, José Filipe Barreto, Miguel Rodrigues, Elsa Fernandes, Ana Delgado, Pedro Rocha and Gonçalo Pessoa for help in the field work. Rui Borralho and David Gonçalves provided useful comments for the design of this study. We thank the thoughtful comments to the manuscript by Pelayo Acevedo and three anonymous referees.